Four 'Heads' Are Better Than One! For as long as I can remember I've been a huge fan of Amanda Hone's incredibly vibrant colorful artwork here at ebsq. 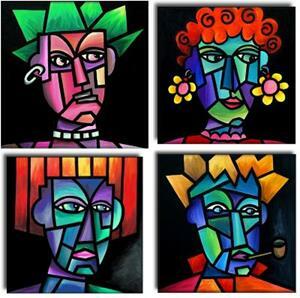 Her bold use of color never ceases to astound and amaze me, and her abstract works are simply "to-die-for". Her whimsical art always makes me smile, and when she combines that with her striking colors, well, the result is simply sublime! Therefore, I chose to rip-off her "Heads" series that she did awhile back. I chose 4 of her heads that I really liked and then went to town. 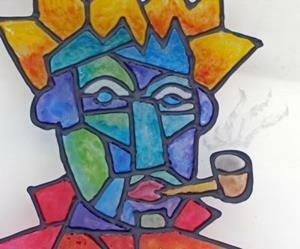 The materials I used to recreate her paintings were Stained Glass Paints, and Liquid Leading for the outlines, and the process was basically to lay down the outlines first, and then fill each section with stained glass color. 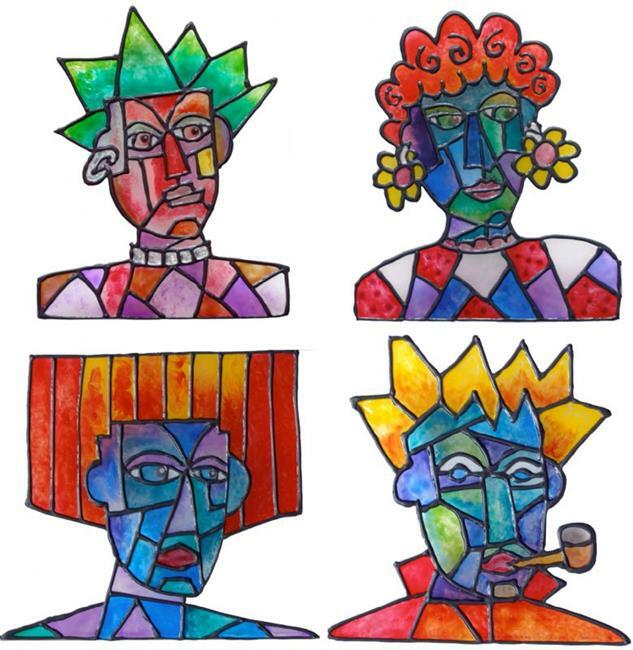 Amanda did each one of these colorful portaits in her usual vibrant colors, but also with her trademark thick black lines in a kind of simulated "faux" stained glass style; therefore, I thought these would be perfect to actually recreate in my stained glass painted style; so I did it. 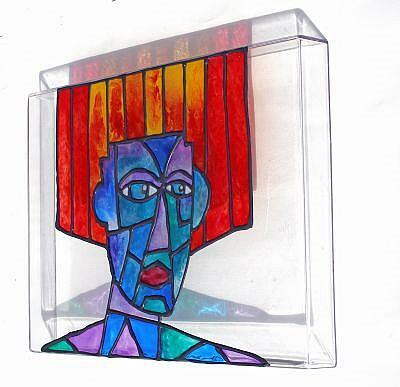 I decided not to change her compositions too much (mostly because they're perfect as is), but rather to concentrate more on trying to recreate her masterful blending of colors into my stained glass painted pieces. Um...this was very hard to do! I guess I just got a crash course in "Amanda Hone Color Theory"! 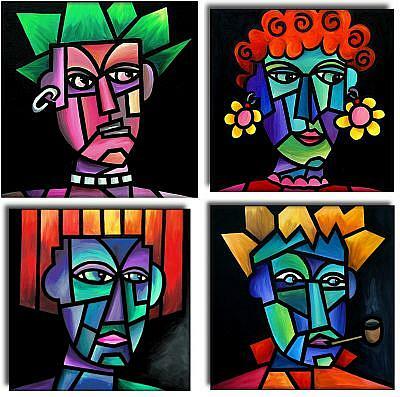 The four "heads" in the series I chose to rip off, were Amandas: "Girl with Attitude", "Girl with Funky Earrings", "Girl with Red Hair" and "Man with Pipe". I call my four: "Amanda is a punk rocker" (named after the Ramone's "Sheena is a punk rocker"), "I Love Lucy (in the sky with daisies)", "My hair's on fire! ", and finally, "Elementary, My Dear Watson". One of the (many) things I love about Amanda's work here is, in her "Man with Pipe" piece, if you look closely you can see she VERY subtlely painted smoke wafting from the man's pipe; it's barely there; diaphanous (almost transparent)...and I tried to do the same, which you can see in the closeup photo I included here (you do have to look really close to see it; that's how subtle it is). The biggest challenge for me here was trying to get the colors blended "just right", Amanda-style. I hope she is pleased with the outcome. I would like to thank Amanda Hone for giving me inspiration and for graciously allowing me to do this series; she's an artist of the highest caliber!